Integral wins the Qipco Falmouth Stakes, Ryan Moore picks up a treble! Moore: "I kept it as simple as I could. Hopefully she can continue to get better. I see no reason why she won't." 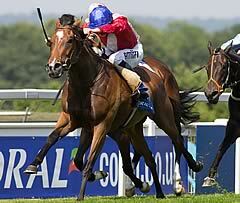 Royal Ascot heroine Integral clinched a first Group One victory with an impressive display under Ryan Moore. The Cheveley Park-owned and -bred filly claimed the Duke of Cambridge Stakes in Berkshire last month and despite encountering more testing conditions on the July Course, she was the 15-8 favourite follow up. Last year's 1000 Guineas heroine Sky Lantern, behind Integral at the Royal meeting but expected to improve, was sent into the lead early on by Richard Hughes and set only a moderate gallop for the first half of the mile contest. Clive Brittain's Rizeena, another Ascot winner having claimed the Coronation Stakes, and Integral were never too far off the pace and moved up to dispute the lead as Sky Lantern disappointingly weakened out of shot. It was soon evident Integral had far more to give than her younger opponent, however, and after switching to the stands' rail in the final furlong, she had plenty in the tank to hold her at bay by two lengths. Peace Burg ran a creditable race in third for Aidan O'Brien, with Sky Lantern eventually coming home a well-beaten fifth. Moore said: "It was always going to be messy sort of race. I thought I was on the best horse and I wanted to keep it simple. I was in front earlier than I wanted to be, but she's improving and hopefully will continue to get better. I see no reason why she shouldn't. "She's a very lightly-raced filly, she won on Oaks day last year (at Goodwood) and has progressed nicely since." Stoute said: "She's done it well. She hasn't been on this sort of ground before and bounces off top of the ground, so we were a bit concerned as we didn't know if she would handle it. We didn't contemplate not running her as we wanted to find out if she would. She's by Dalakhani and very few of those don't go on this sort of ground. "She's in the Sussex Stakes, I don't know if we will take on the colts but there are all the Group Ones and she is well entered up." Brittain said: "Today we were beaten by a better horse, but that's life - she has run right up to what I expected. She's a very good filly, she's lost nothing in defeat and she will probably go on to the Prix Rothschild at Deauville." Rider Joseph O'Brien said of Peace Burg: "She ran a blinder, she is a lovely filly and very versatile."